Home » Posts Tagged "Constitution Day"
No matter what it is, here are five ways JEA’s SPRC can help you (and your students) now. 1. We’re here for you. Whether it’s to study for an upcoming CJE or MJE exam or to help research in a case of censorship, we work to help you and your students. 3. Planning for next year? The Foundations Package is a great place to start. This resource helps by providing some starting points for creating a staff manual that includes a media- or board-level policy, ethical guidelines and procedures. 4. It’s never too early to start thinking about Constitution Day. We will release new materials Aug. 20 to help you celebrate this federally mandated event. 5. 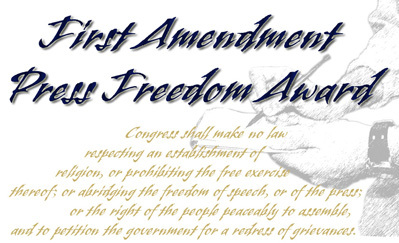 We will continue to support the First Amendment and its application in schools through our support of New Voices campaigns, First Amendment Press Freedom Award and the passage for board statements. SPRC members will select student work that made a difference, post it on jeasprc.org and promote it on Facebook, Twitter and other social media. Let others see the work you have created. When you have something to contribute, please send it to us! CCSS.ELA-Literacy.W.11-12.2a Introduce a topic; organize complex ideas, concepts, and information so that each new element builds on that which precedes it to create a unified whole; include formatting (e.g., headings), graphics (e.g., figures, tables), and multimedia when useful to aiding comprehension. This would be intended to be a lesson I would use with producers in my broadcasting class or even my online editors who often use video and stream events. Students will learn terms that familiarize them with censorship in video and radio. Students will use their skills at gathering information and using online sources to guide them in times of legal uncertainty. Students will learn how to make critical decisions regarding their press rights by applying the case outcomes they learn in this lesson. Introduction & Instruction: The instruction aspect of this lesson includes instruction in what is the FCC and how is video normally regulated. Students will understand what most news broadcast organizations are required to consider when broadcasting. There will also be a clear indication of what is required to be censored with video. It would be helpful if students are familiar with the Hazelwood court case and the Tinker court case before this lesson, but it is not a requirement. Who governs free speech on radio and television? What is censorable on television? For most high school programs, students publish videos online. The FCC does not govern such publication; however, students can still make decisions with this knowledge. Is the video part of a school sponsored publication or is it for an individual? What is the publication’s forum status? In the following case, a student shot video of a post-fight activity in a school. That camera was confiscated along with the video. Read the following account or what happened, and the SPLC response to determine if the student’s rights were violated. We will briefly explain what happened in this case from 2004. Next I ask the students to identify what in the school handbook should protect this student journalist. As a final element to the 35-minute discussion I ask the students to conclude if this scenario impacts our publication and work. Key pages such as the SPLC web page will be introduced as a primary source for research as it involves the law of the student press. Sometimes this will take longer than 35 minutes. Practice: Students will pick from one of the following cases chronicled on the SPLC site. They will read the article and answer the questions below to the best of their ability. Students need to be prepared to briefly describe what happened in the case they have chosen to the class. They can brief the class by presenting their responses to the questions. • Who does the case involve? • What happened in the case? How does it involve video? • Who has made the decision? • Was this case similar to any other cases you have heard about? What was it? • How does this situation relate to Hazelwood or Tinker? • Does the video include anything that is obscene, indecent, or profane? • How could this case set a precedent? • Name and document any other sources from the web that pertain to this case. III. Application: Have students decide together which case could most likely occur this school year. Students should outline a policy in their staff manual that will inform students how to proceed should a similar scenario to the one that they have researched could develop. The policy should be agreed upon by the entire staff and be introduced to the administration, along with any updates on the staff manual, for the year. Assessment: Credit for completing questions on case. Credit for hypothetical scenario. Credit for reflection in daily log. Each assignment is worth 33% of the total unit grade. See RUBRIC ON NEXT PAGE. Assessment: Credit for completing questions on researching topic. Credit for hypothetical scenario. Credit for reflection in daily log. Each assignment is worth 33 percent of the total unit grade. All questions are answered thoroughly with great detail included about case and sources (Special Attention Ques 6). All questions are answered adequately with some detail included about case and sources (Special Attention Ques 6). Most questions are answered. Question 6 must be answered. Some questions are answered. Question 6 must be answered. The created scenario must be on topic with a great amount of detail included about case and sources (Special Attention Ques 6). The created scenario must be on topic with enough details to answer questions from activity one (Special Attention Ques 6). The created scenario addresses topic and answers most of the questions from activity one (Special Attention Ques 6). A scenario is created and it answers some of the questions from activity one (Special Attention Ques 6). In preparation for Constitution Day 2015, several members of the Scholastic Press Rights Committee (SPRC), a committee of the Journalism Education Association, created lesson plans specific for the event. We suggest celebrating the day Sept. 17. Please contact me if you have any questions or feedback about the lessons or how to implement them. For a video about the lessons, go to https://youtu.be/39c8sZVmT20. • Crossword Puzzle, by Lori Keekley. For fun activities to celebrate Constitution Day in a number of curricular areas. • Understanding the perils of prior review and restraint, by Jeff Kocur. Click here for the activity. For additional resources and model ethical guidelines and staff manual procedures for this, go here and here. • Listening with a skeptical ear: checking source accuracy and credibility by John Bowen. With candidates jostling for positions in the 2016 presidential election and numerous state, local races taking shape and issues developing readers and viewers face an onslaught of information not limited to politics. Student journalists must able to separate valid from questionable information and know how to determine if sources and their messages are credible. • Where should journalists draw the line? by John Bowen. By examining The Huffington Post’s announcement it would only report Donald Trump’s bid for the Republican nomination for president on the entertainment pages, students can further explore ethical issues pertaining to the decision while again examining the role of media. • Should there be limits to taking a stance in front page design? by John Bowen. This lesson examines the ethical and philosophical issues as to whether it is OK for a student newspaper to Rainbow Filter its Twitter profile picture or show any unlabeled viewpoint. • Censorship and broadcast video by Chris Waugaman. This lesson would be intended to be a lesson used with producers in a broadcasting class or even anonline editors who often use video and stream events. Students will learn terms that familiarize them with censorship in video and radio. Students will also learn how to make critical decisions regarding their press rights by applying the case outcomes they learn in this lesson. To see past years’ lessons, go here.